The new Polycom VVX1500 is probably the single most exciting and useless product ever released from Polycom. The phone is positioned (too well) as a model for the future. It has rich media capabilities, a built in webcam, and comes with several applications.The only problem with it is it doesn’t appear particularly friendly toward any specific telecom solution other than Broadsof’s hosted offerings. The Asterisk community has practically named Polycom their vendor of choice, but somehow this new revolutionary phone got released with firmware that is incompatible with Asterisk and many other SIP phone systems. Switchvox SMB 4 came out just before this phone with a new feature of video conferencing, and somehow the VVX1500 remains incompatible with it (Grandstream offers the only supported phone). What is really odd is the phone isn’t getting any love from any of the limited platforms that do support it. Mitel has never embraced a non Mitel phone, yet at VoiceCon MCO Polycom declared Mitel as the only PBX currently supporting the VVX1500. I visited Polycom.com and used their chat feature to ask which phone systems (I think there are about 3 now) can use the VVX1500 and the representative was unable to find any list. My first thought was Polycom got pressured to limit its support, but there doesn’t appear to be a logical victor or culprit to substantiate that theory. I checked with some sources at Polycom. They said Asterisk is actually great with the VVX1500, but requires a hack. I checked with some folks at Digium and they confirmed both companies are working toward a resolution. What that means who knows, probably a firmware update. Meanwhile, Polycom’s benchmark SoundPoint line has become notably stagnate. The only recent improvement was the IP670 which is the same as the IP650 with a color screen. All of the SoundPoint phones look farily similar, but very different than the VVX1500. I wonder if the cash cow Soundpoints are nearing their end of life in lieu of the new VVX platform which supposedly will grow into a new strategic product line. Even if SoundPoint R&D; is terminated, the products will likely continue to sell well for several years. Polycom makes too many phones. The new CX line (likely not made by Polycom) for OCS are clearly a notch below the Soundpoints – but was a separate line really necessary versus separate firmware offerings? The VVX1500 is potentially a game changing device. The Soundpoint’s really don’t capitalize on their IP capabilities – the microbrowser is very limited and largely ignored and the available applications from Polycom aren’t particularly compelling. The VVX1500 has a video camera, which obviously can be used for video, but why stop there? Cameras are great at detecting motion – motion can be used to determine lots of interesting things – such as presence (more accurately than keyboard actvity) and occupancy (building controls, security alarm, tracking). Consider the security capabilities (and risks) of having a motion sensor in each cube and office. The phone today detects motion through the camera to determine to wake up (turns off the screen saver), the question is can that motion be translated into an IP event?The always on IP device’s screen is typically demonstrated with personal photos as the screen saver, but the real opportunity is real time information ranging from weather, stock tickers, parking lot videocams, or relevant dashboard information (inventory, billing, transactions, etc. ).The more robust screen and application environment, along with the the camera could push this phone into the possible yet elusive “third screen” category. But before it can best the SoundPoint’s it needs to meet the basic functionality and compatibility of the SoundPoints. Irconically, the Soundpoints have been the compatible measure for many SIP phones – it has been easier for phone system vendors to ensure SoundPoint compatibility rather than SIP generally since the standard is so wide. 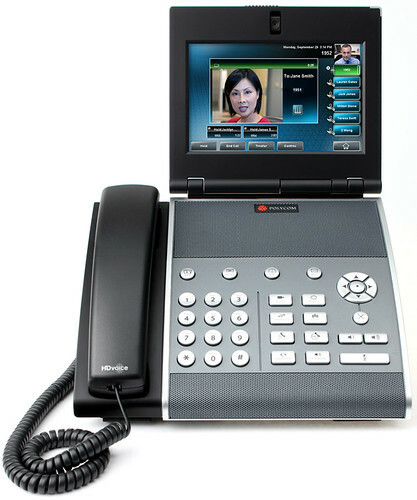 For reasons I can’t fathom, Polycom ignored their extensive experience when they released this phone. I look forward to the next iteration of the Polycom VVX series, hopefully with broader appeal.